Agave is the common name and genus name of a large, botanical, New World group of succulent plants in the flowering plant family Agavaceae, characterized by large, basal rosettes of thick fleshy leaves typically with a sharp terminal point and spiny margins. 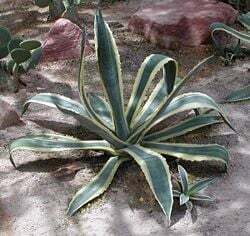 One of the most familiar species is Agave americana, the American aloe, which is also known as the "century plant" because of the long time before the plant flowers. Agave are popular as ornamental plants, as well as providing food and fiber. The flowers, leaves, stalks or basal rosettes, and the sap all are edible and some varieties of Agave are made into the alcoholic beverages mescal and tequila. The rare bloom of the century plants are a wonder to behold, for the plant prepares for a number of years for the moment when it can flower and reproduce, yielding a spike with a cyme of big yellow flowers, only to die after flowering. Ecologically, the plants provide food and water for animals. The Agave genus is part of the Agavaceae family, a group of plants that includes many well-known desert and dry zone types such as the yucca, and Joshua tree. The family includes about 550-600 species in around 18 genera, and is widespread in the tropical, subtropical, and warm temperate regions of the world. In general, Agavaceae leaves occur as rosettes at the end of a woody stem, which may range from extremely short to tree-like heights, as in the Joshua tree. The leaves are parallel-veined, and usually appear long and pointed, often with a hardened spine on the end, and sometimes with additional spines along the margins. Members of the Agave genus are succulent plants. Members of the family Agavaceae may or may not be succulent. Also known as succulents or fat plants, succulent plants are water-retaining plants adapted to arid climate or soil conditions. Succulent plants store water in their leaves, stems, and/or roots. The storage of water often gives succulent plants a more swollen or fleshy appearance than other plants, also known as succulence. Agaves are chiefly Mexican, but occur also in the southern and western United States and in central and tropical South America. The plants have a large rosette of thick fleshy leaves generally ending in a sharp point and with a spiny margin. The stout stem is usually short, the leaves apparently springing from the root. Each rosette is monocarpic and grows slowly to flower only once. During flowering, a tall stem or "mast" grows from the center of the leaf rosette and bears a large number of shortly tubular flowers. After development of fruit, the original plant dies, but suckers are frequently produced from the base of the stem, which become new plants. It is a common misconception that agaves are a cactus. Agaves are closely related to the lily and amaryllis families, and are not related to cacti. Along with plants from the related genus Yucca, various Agave species are popular ornamental plants. The most commonly grown species of Agave include Agave americana (century plant), Agave angustifolia, Agave tequilanam (blue agave), and Agave attenuata. One of the most familiar species is Agave americana, a native of tropical America. Common names include century plant, maguey (in Mexico), or American aloe (it is not, however, closely related to the genus Aloe). The name "century plant" refers to the long time the plant takes to flower, although the number of years before flowering occurs depends on the vigor of the individual, the richness of the soil, and the climate. When it flowers, the spike with a cyme of big yellow flowers may reach up to eight meters (25 ft.) in height. The plant dies after flowering. During its non-flowering preparation period, the plant is storing in its fleshy leaves the nourishment required for the effort of flowering. The average life-span is around 25 years. Agave americana, century plant, was introduced into Europe about the middle of the sixteenth century and is now widely cultivated for its handsome appearance. In the variegated forms, the leaf has a white or yellow marginal or central stripe from base to apex. As the leaves unfold from the center of the rosette, the impression of the marginal spines is very conspicuous on the still erect younger leaves. The tequ plants are usually grown in tubs and put out in the summer months, but in the winter require protection from frost. They mature very slowly and die after flowering, but are easily propagated by the offsets from the base of the stem. A. attenuata is a native of central Mexico and is uncommon in its natural habitat. Unlike most species of Agave, A. attenuata has a curved flower spike from which it derives one of its numerous common names: the foxtail agave. A. attenuata is also commonly grown as a garden plant. Unlike many agaves, A. attenuata has no teeth or terminal spines making it an ideal plant for areas adjacent to footpaths. Like all agaves, A. attenuata is a succulent and requires little water or maintenance once established. Agaves are used for food and fiber, and as ornamental plants. Four major parts of the agave are edible: the flowers, the leaves, the stalks or basal rosettes, and the sap (called aguamiel—honey water) (Davidson 1999). Each agave plant will produce several pounds of edible flowers during the summer. The leaves may be collected in winter and spring, when the plants are rich in sap, for eating. The stalks, which are ready during the summer, before the blossom, weigh several pounds each. Roasted, they are sweet, like molasses. During the development of the inflorescence, there is a rush of sap to the base of the young flower stalk. In the case of A. americana and other species, this is used by the Mexicans to make their national beverage, pulque. The flower shoot is cut out and the sap collected and subsequently fermented. By distillation, a spirit called mezcal is prepared; one of the most well-known forms of mezcal is tequila. In 2001, the Mexican Government and European Union agreed on the classification of tequila and its categories. Pure (100%) Blue Agave Tequila must be made from the Weber Blue Agave plant to rigorous specifications and only in certain Mexican states. Although Agave americana contains a toxin and is poisonous when eaten raw, it is considered to have a sweat mild flavor when baked or made into a syrup (Herbst 2001). Agave syrup (also called agave nectar) is used as an alternative to sugar in cooking, and is promoted as a healthy alternative. Fiber is obtained from the leaves of several Agave species, including Agave rigida var. sisalana, sisal hemp, and Agave decipiens, false sisal hemp. Agave americana is the source of pita fiber and is used as a fiber plant in Mexico, the West Indies, and southern Europe. The plants have additional uses. When dried and cut in slices, the flowering stem forms natural razor strops, and the expressed juice of the leaves will lather in water like soap. The natives of Mexico have used agave to make pens, nails and needles, as well as string to sew and make weavings. In India, the plant is extensively used for hedges along railroads. When dried out, the stalks can be used to make didgeridoos, a wind instrument. Some agaves are used medically. Leaf tea or tincture taken orally is used to treat constipation and excess gas. It is also used as a diuretic. Root tea or tincture is taken orally to treat arthritic joints. Ecologically, Agave species are used as food plants by the larvae of some Lepidoptera species including Batrachedra striolata, which has been recorded on A shawii. The juice from many species of agave can cause acute contact dermatitis. It will produce reddening and blistering lasting one to two weeks. Episodes of itching may recur up to a year thereafter, even though there is no longer a visible rash. Irritation is, in part, caused by calcium oxalate raphides. Dried parts of the plants can be handled with bare hands with little or no effect. Agave is a genus within the family Agavaceae, which is currently placed within the order Asparagales. Agaves were once classified in the lily family, Liliaceae, but most references now include them in their own family, Agavaceae. The genus Agave is divided into two subgenera: Agave and Littaea. Agaves have long presented special difficulties for taxonomy; variations within a species may be considerable, and a number of named species are of unknown origin and may just be variants of original wild species. Spanish and Portuguese explorers probably brought agave plants back to Europe with them, but the plants became popular in Europe during the nineteenth century when many types were imported by collectors. Some have been continuously propagated by offset since then, and do not consistently resemble any species known in the wild, although this may simply be due to the differences in growing conditions in Europe. Asimov, E. 2000. Reaching for better quality tequila. Journal Record. October 6, 2000. Retrieved January 2, 2008. Gentry, H. S. 1982. Agaves of Continental North America. Tucson, AZ: University of Arizona Press. ISBN 0816507759. This page was last modified on 8 February 2019, at 17:12.